PTDC Motel Moen Jo Daro has 9 rooms and a Restaurant other facilities include TV and telephone. Ideal for an overnight stay during visit to Moenjodaro ruins. PIA operates daily flight from Karachi. Moenjodaro is also linked by road and railway. The motel remains open round the year. Although a very small hotel but it has a big restaurant which can accomdate upto 100 guests for small event. 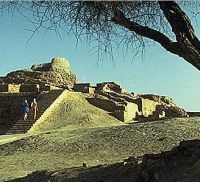 Nearby Moen Jo Daro is a great attraction. PTDC Motel Moenjo Daro in Larkana, offers above rates only to Hunza tours. The online reservation payment must be made to Hunza tours not the hotel. Book your events, Meetings, Conferences Marriage parties at PTDC Motel Moenjo Daro or any other hotel in Larkana please feel free to email us we will offer you the best possible rates and perfect arrangements to suit your events. For room reservations at PTDC Motel Moenjo Daro Larkana please contact usTravel & Culture Services are hotel reservation agents in Pakistan. We reserve hotels at special discounted rates for individuals and companies.